As a photographic restoration artist for over 35 years and dealing with thousands of images, I have come across my fair share of torn, moldy, faded, damaged old photos and have had some very bizarre requests for photo projects. With knowledge of restoration comes a understanding of the techniques, materials and learning the age of the photos I've had in in my possession for a short time. Some times I've been able to clear up are family mysteries; like the time I had a client not understanding why a group photo of her father, grandfather and great-grandfather could be in the same picture together with different period of suits on them. "How could they be wearing such different and outdated outfits if the photo was taken at the same time?" she asked me. "That's because the group photo wasn't taken at the same time," was my reply. Very simply, I explained, the photographer had 3 different photos of the men (through the different eras spanning 40 years) and superimposed or made a vignette of them together as a group, making them appear the same size and same sepia tone to match and unify the composition. In fact, I pointed out the remains of a background near her grandfather's leg with a pedestal that didn't belong there (that the photographer missed cropping out). She was surprised that photographers years ago (the birth of photography dates to the early 1840's) had the ability to do that and indeed they had great talent and abilities with the materials and methods (some lost to the ages) at their disposal and some adopted clever tricks with their equipment to gain success and fame. One of the most popular of them was Spirit Photography which has a strong history dating back to the late 19th century. It is a type of photography whose primary attempt is to capture images of ghosts and other spiritual entities, especially in ghost hunting using the current camera equipment of the time. Spirit photography was first used by William H. Mumler in the 1860s. Mumler discovered the technique by accident, after he discovered a second person in a photograph he took of himself, which he found was actually a double exposure. Seeing there was a market for it, Mumler started working as a medium, taking people's pictures and doctoring the negatives to add lost loved ones into them (mostly using other photographs as basis). 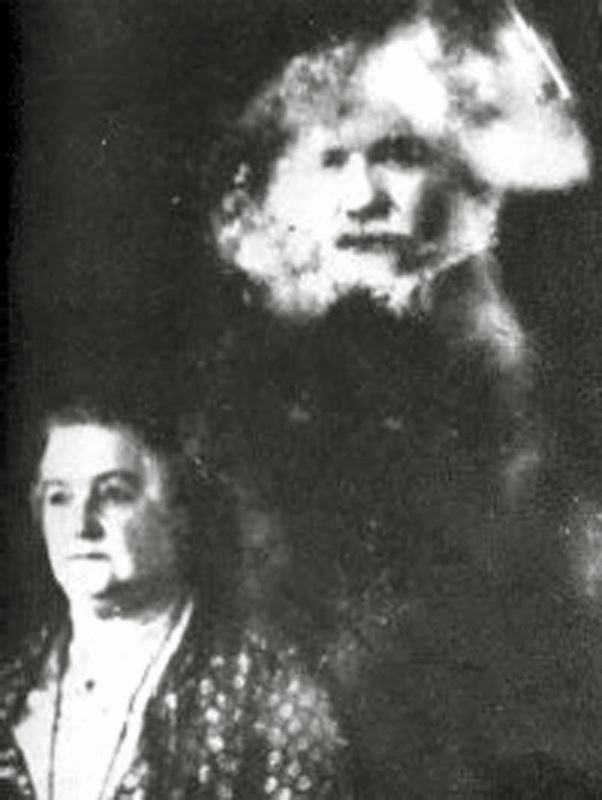 One of Mumler's most famous images, purportedly showing Mary Todd Lincoln with the ghost of her husband, Abraham Lincoln. In my artist's opinion Lincoln looks to be more of an artist's charcoal drawing rendered onto the background after the first image of Mrs. Lincoln was taken.The high quality cotton rag paper used at the time for photographing images would lend itself a perfectly surface to the medium of charcoal and the whites of the hands could be another person's hands-double exposed or sketched with white pencil or chalk. Mumler's fraud was discovered after he put identifiable living Boston residents in the photos as spirits. Not a very smart thing to do! Other spirit photographers also started to sell their "other worldly" photographs. A later spirit photographer was Fred A. Hudson, who took many spirit photographs for spiritualists in 1872. 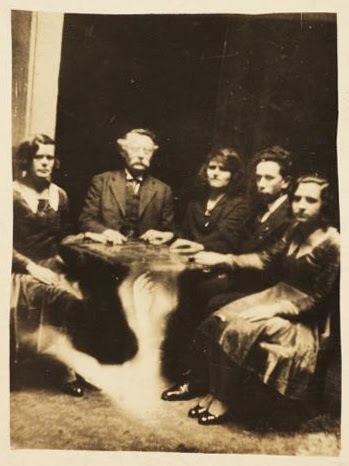 Through the 1880s into the early 20th century spirit photography remained popular, with notable proponents such as Arthur Conan Doyle (famed author and creator of Sherlock Homes) and William Crookes.William Stainton Moses, another spiritualist, claimed that spirit photography operated by means of a fluid substance called ectoplasm, in which the spirits take form. One of the later spirit photographers was William Hope (1863–1933). An early photo by William Hope pro-portly showing a spirit forming out of ectoplasm or he's having a really bad hair day!. A psychical researcher Harry Price revealed that the photographs of Hope were frauds. Price secretly marked Hope's photographic plates, and provided him with a packet of additional plates that had been covertly etched with the brand image of the Imperial Dry Plate Co. Ltd. in the knowledge that the logo would be transferred to any images created with them. Unaware that Price had tampered with his supplies, Hope then attempted to produce a number of Spirit photographs. Although Hope produced several images of spirits, none of his materials contained the Imperial Dry Plate Co. Ltd logo, or the marks that Price had put on Hope's original equipment, showing that he had exchanged prepared materials containing fake spirit images for the provided materials. 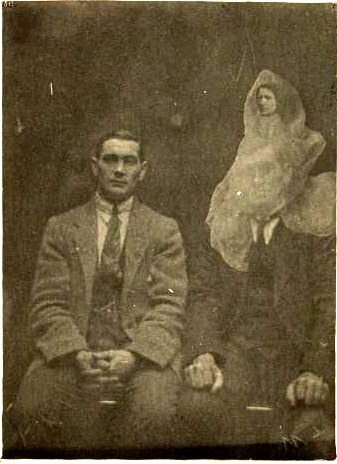 This image shows two Welsh mediums sitting for a photo in 1920 with the image of their deceased grandmother above them – or supposedly so. (poor man, looks like he could suffocate.) The mediums claimed that it is the only image of their grandmother there was. Hope is likely to have just superimposed a photograph of the woman over theirs to create the illusion. 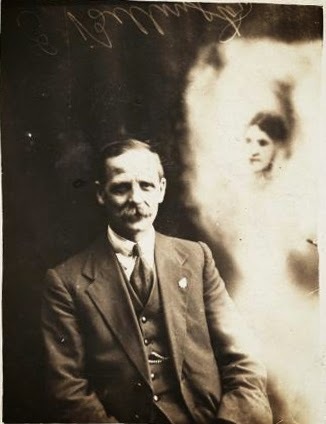 Another example we see the eerie appearance of an ethereal woman's face to the right of the man, a ghost said to be the man's deceased first wife. 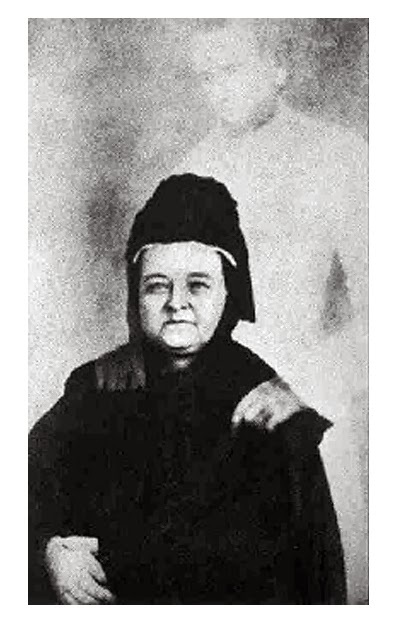 Many believe Hope either already had a picture of the woman or asked the man for a picture to help him contact her in the 'ether-world' of the spirits. William Hope continued his work all his life but had another major denunciation in 1932 when Fred Barlow, a former supporter, gave a speech to the Society for Psychical Research, concluding that he was fraudulently placing other images over the people seated in his photographs. Hope died in 1933, so it is hard to say if this had any effect on his reputation at the time. Here we have a group in the middle of a seance, taken in about 1920. It's spooky effect makes it look like the table is levitating, though the most likely scenario is that the image of a mystical arm has been double exposed onto the picture. In his book Fifty Years of Psychical Research, Price listed many spirit photographers who had been exposed as frauds. Price who had spent most of his life studying psychical phenomena wrote that "There is no good evidence that a spirit photograph has ever been produced." Which is also the view of most psychical researchers today, but research in this field is being taken very seriously by members of the paranormal a community and likely to advance to unexpected discoveries with the advent of new equipment and techniques. Who knows? Perhaps William Mumler,William Hope and the others really did find that there is more to life than we can see with the naked eye! Although unlikely, they did a good job in the days before digital photography to conjure up "ghosts"! Thank you for your comment. I will look you up on your blog. Take care and blessings to you and your family.